So you've pre-ordered your iPad, or there'll be one with your name on it at the local Apple Store. You've combed apple.com/ipad more times than you can count, trying to hunt down more hidden details that Steve Jobs neglected to show off during his January keynote. But have you bought a case? You know, a bag, sleeve, or compartment, preferably with some kind of padding and soft lining, for protecting your iPad while in transit. You probably have one for your MacBook, and if you intend to venture beyond your living room with your iPad, you'll want to take the same care with your newest investment. Even though the iPad doesn’t ship for a couple weeks, vendors have wasted no time in preparing all manner of cases: sleeves, backpacks, messenger bags—there's even one designed to carry a DSLR and an iPad together. Most are already up for pre-order, with manufacturers promising they will ship “soon” or “within a couple weeks of the iPad.” Here's a list of the iPad protection we know about so far, alphabetized by manufacturer, for your iPad-toting pleasure. Be.ez: Be.ez makes a wide variety of sleeves, backpacks, shoulderbags, “urban bags,” and more. The company announced (PDF link) four colorful, striped iPad versions of its slim LA robe Allure sleeve. While no prices are yet listed, you can see images of the LA robe iPad Allure in the “special editions” section of Be.ez's press area. Belkin: A major accessory manufacturer that's tough to miss no matter where you shop, Belkin has a few sleeves on the way. The Vue Sleeve for iPad is a light neoprene case designed to fit inside another bag. It features an iPad compartment and a slim, see-through outer pocket for small accessories. The Max Sleeve for iPad is a similar sleeve with has a pleated outer design that expands to fit extra accessories. For the butterfingers in the audience, Belkin’s Grip Sleeve for iPad features a textured surface designed to offer a better grip for carrying. Prices are not yet available. 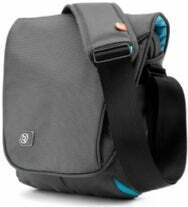 BBP: Though few details of the DSLR Slinger are available on the BBP Website—just a "Coming Summer" note—the company told Macworld that the bag is aimed at photographers and will feature compartments for an iPad, a DSLR, and accessories. Booq: Booq makes a range of sleeves, shoulder bags, backpacks, and messenger bags for Apple and other manufacturers. The company has debuted a line of iPad cases with prices ranging from $25 to $70. Cocoon: Maker of colorful and unique gadget accessories, Cocoon has a couple iPad cases on the way. The $30 Gramercy Messenger Sling is a messenger bag that holds an iPad along with a removable sleeve that secures small items such as pens, sunglasses, ID cards, and a point-and-shoot camera. The bag also features a unique see-through outer pocket that keeps an iPhone or iPod touch visible and accessible. The $55 Harlem iPad/Netbook Sling offers a different style as a single-strap sling pack with spaces for an iPad, a media player, and the previously mentioned accessory sleeve, along with extra storage for other items. Each sling is water resistant and available in three colors. Griffin Technology: Longtime Apple-accessory vendor Griffin has announced a range of iPad-protection products, ranging from a slim, folio-style case to various sleeves to and a screen-care kit. Information on prices and availability isn't yet listed. Hard Candy: Started by the founder of Speck Products (below), Hard Candy is similarly a makers of rigid, protective sleeves and covers. The company has announced a selection of iPad cases that includes two sleeves and three “skins,” the latter including a removable face plate designed to protect the iPad’s display when not in use. Prices range from $40 to $50. Hip Handmaids: This Etsy case designer decided to run with one of the more, um, personal plays on the iPad's name. Hip Handmaids’ iMaxi is indeed a real product and available to order; if you order before March 30, you even get a $10 discount. Don’t say we didn’t warn you. iLuv: Makers of a wide variety of colorful cases and accessories for Apple’s i-devices and RIM’s BlackBerry, iLuv is expanding its lineup to iPad. The company has posted a new iPad section (careful: as of the time of publication, that link crashes Safari in Snow Leopard for some odd reason) containing a variety of soft sleeves, hard and clear shells, and display films, the last in in clear, anti-glare, and mirror flavors. Prices range from $15 to $40. Incipio: Incipio's Website is previewing four hardshell cases for the iPad on the company's site. Each case is offered in a variety of colors and textures, and all look to offer form-fitting protection for carrying your iPad around. No prices or ship dates are yet available. LaCie: If you bought an external hard drive in the past decade, you've probably heard of LaCie. The company also makes a variety of accessories, including speakers and notebook cases. LaCie’s $25 ForMoa 10.2" is a general-purpose messenger sleeve, designed for 10.2-inch netbooks, that claims to fit the iPad nicely. Available in five colors, the sleeve provides a couple extra pockets for carrying extra accessories or reading material. The $15 Coat Laptop 10.2", available in the same five colors, is a slim vertical sleeve with a small accessory pocket. Both products are available now. Macally: This popular accessory maker already lists nine different iPad cases and stands on the company's Website. Some are slim protective shells, others serve as stands for viewing media. All are listed as “coming soon,” with no prices yet. ModulR: ModulR has announced what looks to be a very unique accessory system for the iPad. Building off a form-fitting iPad case, the company offers a variety of attachable stands, arms, and other peripherals for fitting the iPad into different situations. The system will be available this summer; no prices are listed. 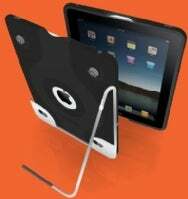 NLU Products: The scratchproof-film vendor is currently taking pre-orders for its BodyGuarz for Apple iPad. You can purchase protection for the display alone for $20, for the back of the iPad only for $25, or full coverage for $30. Orbino: Easily taking the prize for Most Expensive Case So Far, Padova offers $209 Padova Case for the iPad. Featuring a fold-over folio design, Orbino’s iPad case features hand-stitched leather and the capability to prop up the iPad for viewing media. No ship date is listed. Padster: Padster appears to have been started specifically to make iPad cases, and the company claims to be designing “the ultimate iPad bag.” No price is listed, though the virtual store banner says it will open in early April. Interested customers can sign up to be notified when more information is available. Philips: This longtime electronics vendor says it's “right there with you” in terms of iPad excitement. The company's Website previews a couple slim cases and a screen protector that are in the works, although details about features, prices, and ship dates are absent. Scosche : Scosche Industries specializes in accessories for cars, iPods, iPhones, netbooks, and more. The company has announced its upcoming KickBack P iPad case, but has yet to add details or photos to its Website. As the name suggests, the polycarbonate-and-rubber KickBack P features a locking kickstand for propping your iPad at various angles for typing or viewing media; it also includes molded grips for secure carrying. The KickBack will ship in early- to mid-spring, although Scosche has yet to announce pricing. Skooba Design: While none of Skooba's cases for notebooks, cameras, or other gadgets are actually rated for underwater use, the company’s first iPad cases are worth a look. 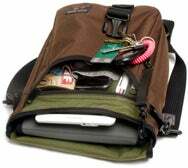 The $50 Netbook/iPad Messenger features a compartment that fits the iPad and most netbooks, with pockets and compartments for storing accessories, books, magazines, and a water bottle. The $20 Netbook/iPad Neo-Sleeve is a slim sleeve with a removable strap, a pocket for a power adapter, and another pocket for a USB thumb drive. Both products are available now in four colors. STM: A notebook case maker from down under, Australia-based STM is a popular name among Mac bag nerds. Neither of its initial iPad cases were designed specifically for the the device, but the company claims they'll fit the iPad just fine. The $45 Micro XS is a slim, nylon shoulder bag with room for a couple small accessories, a key fob, and an ID holder. The $50, canvas Scout XS is a similar bag for small laptops and netbooks that offers a bit more style and more room for extras. Tom Bihn: Specializing in a broad variety of travel bags, Tom Bihn has so far announced two options for iPad. The $110 Ristretto for iPad/Netbooks is a vertical messenger-style bag with an iPad compartment, as well as pockets for accessories, keys, pens, a water bottle, and more. Three styles of shoulder straps are available, as are a variety of color schemes. The company also has the $30 Cache, a generic, all-purpose notebook and netbook sleeve that fits the iPad. It’s TSA Checkpoint Friendly and available in gray. Uncommon: Uncommon’s game is customizable hardshell cases for iPhone, iPod touch, and now the iPad. The company will emblazon your iPad Capsule with your own artwork, or you can pick from a stock gallery. (See our video from Macworld Expo for some examples.) No pricing or ship date have been announced. Vaja: Purveyor of fine, customizable leather cases for a variety of gadgets, Vaja offers the $120 Retro Slim Jacket for Apple iPad. It’s a slim, handcrafted, leather case with a magnetic snap closure, and just like the rest of Vaja’s lineup, you can add your own style by choosing the base and trim colors. Information on availability is not listed, though the company says the "handicraft" production process takes 25 days. Waterfield: Well-known among Apple case aficionados, Waterfield has four iPad cases available for pre-order, with shipment "within one week of iPad ship date." There’s the iPad Ultimate SleeveCase, a slim, customizable folio-style case with an optional shoulder strap, TSA Checkpoint friendliness, and a starting price of $55 ($59 if you prefer leather trim, plus $7 to $15 for the shoulder strap). The iPad Suede Jacket is a slim, Ultrasuede sleeve in two styles: a $25 model with a back pocket for a power adapter and headphones, and a $19 pocketless version. You could also go with the $29 iPad Slip Case, a slim padded sleeve made of waterproof material, available in six colors. Lastly, the $59 iPad Smart Case is a rigid sleeve, also available in six colors, with a low-profile pocket that can hold your iPad's USB cable and power adapter. That’s what we have so far, though it goes without saying that more vendors will surely jump on the iPad case bandwagon over the next few weeks and months. If you want to be ready with an iPad case as soon as possible, though, you’re bound to find a solid option somewhere on this list.